15-year-old Ajibola Oluwatosin Olumayowa has emerged as the best candidate so far in the 2018 Unified Tertiary Matriculation Examination (UTME), following the release of results, Vanguard reports. It was initially believed that a Corona Secondary School student, Ibukun Oduntan, had the highest score, as he earned 344 marks. 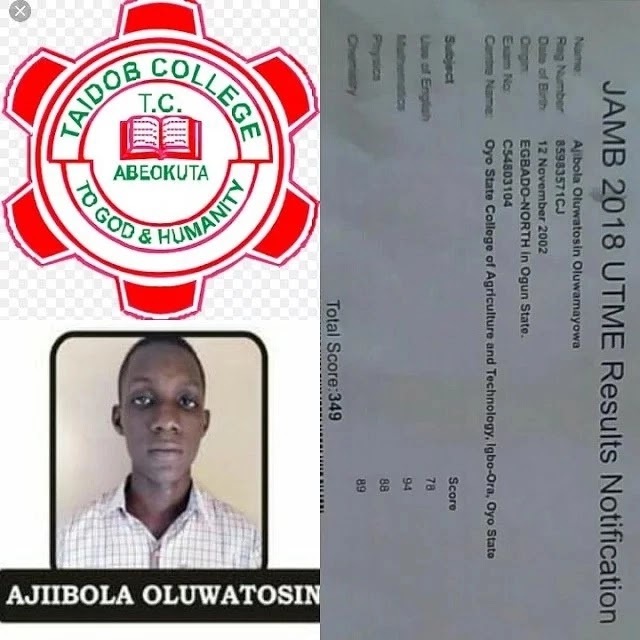 Olumayowa's school, Taidob College, Asero Estate, Abeokuta, Ogun state, however disclosed to newsmen on Wednesday, March 21, that their student had emerged with the highest score of 349. The development comes following an earlier report by Humb's Blog, that Oghotomo Ogheneruno Goddowell, a 16-year-old boy from Ethiope East in Delta state, may have set a new record for the Joint Admission Matriculation Board exam, as he scored 321 points. Goddowell wrote his exam at the Benchill schools, Warri Delta state. Another unverified result that surfaced online with the same 321 marks, belonged to 18-year-old Yusuf Najeeb Lawal from Musawa in Katsina state. Lawal wrote his exam at Kaduna polythecnic, Tudun Wada, Kaduna state.